The UC employees union, a chapter of the American Federation of State, County and Municipal Employees, began its walkout at 4 a.m. Tuesday from medical centers in San Diego, Orange, Los Angeles, Santa Monica, San Francisco and Sacramento. The strike prompted UC officials to postpone some surgeries and chemotherapy sessions for children. The union, which represents 13,000 hospital pharmacists, nursing assistants, operating room scrubs and other health care workers, says it refuses to accept a proposal that would require more employee contributions by current workers and a second tier pension plan with reduced benefits for new hires. The proposal is similar to a plan accepted by other state workers. Union officials also contend that the state should divert money away from executive pensions and direct it toward adding medical staffers. “We care about our patients and we feel that we’re chronically understaffed and we need additional help,” Los Angeles radiation therapist Ruben Gomez told KCBS. More than 2,000 workers are expected to walk out at UC facilities in Los Angeles and Santa Monica. Gomez said the strikers set up a task force to ensure that critically ill patients receive care. On Monday, Sacramento County Superior Court Judge David Brown partially granted an injunction to stop the strike. Brown ordered 453 workers to remain on the job. 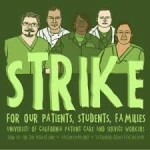 “There is reasonable cause to believe the strike would prevent delivery of an essential public service,” Brown said. Maybe they should check the unemployment lines and career opportunities elsewhere. Selfish and greedy……go find another job you FOOLS. What if the TAXPAYERS went on strike? I have nothing against anyone trying to earn a living wage, but to have to pay for unfunded perks, bennies and insurance for those who do not pay in to the pool adequately, is going to stop. This is not a city, county, state or a federal problem it is universal. It was one of the unintended consequences of the process by which all public employees and many private employees were hired under. Who in their right mind would say no to a supposed “free” perk were it to be offered in order to entice you to take a job? The free ride is overand the contracts need to be revisited in order to make those gaining, also pay in according to their pay scale. Well said, easymoney, well said. In fact, I’m jealous. I couldn’t have expressed better the Libertarian point of view myself.